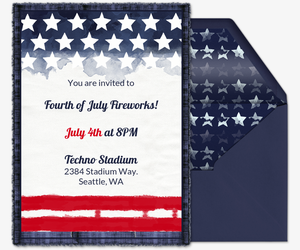 Bring forth the party this Fourth of July with hand-illustrated digital invitations from Evite. 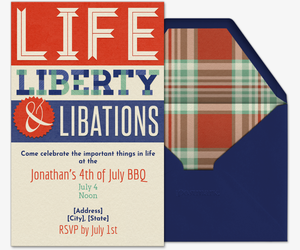 Whether you’re planning an all-American cookout for the whole family or getting together for beers and cheers with your friends, our Fourth of July invitation collection has a design fit for your formal or casual patriotic party. 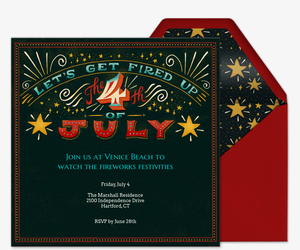 Choose from dozens of easy-to-use digital designs to get guests fired up. Paperless designs make customization super simple. 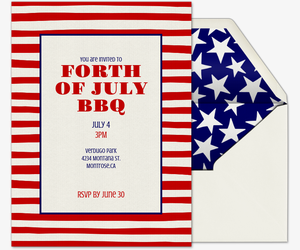 If you’re planning a red, white and blue BBQ, organize contributions using our “What to Bring” tool. You can also track RSVPs, manage your guest list, send messages, and share party photos with everyone before, during, and after the event. Missing an email address? Just send your invitation’s shareable link via text or post it across your social media networks. 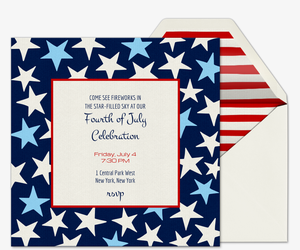 Independence Day is a big deal, so make your star-spangled event extra-special by sending a Premium invitation. 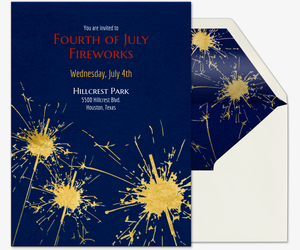 Our advertisement-free invites offer the same look and feel as printed invitations and come with matching digital colored envelopes and customizable stamps. Pricing is based on the size of your guest list. 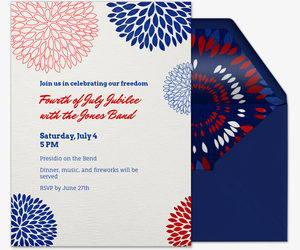 Personalize your online invitation by featuring a favorite photo on one of our upload-your-own invitation templates, or start from scratch by designing your own file and uploading it onto a fully customizable design-your-own invitation template. Do justice to your right to party with festive tips from Evite Party Ideas at ideas.evite.com. Cover all your bases with food and drink ideas, then add some stars and stripes with DIY confetti poppers, American flag fruit skewers, picnic inspiration, and more. Plan all your summer parties with Evite. 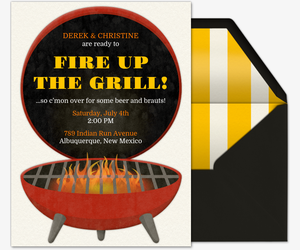 Our gallery also features BBQ invitations, beach party invitations, pool party invitations, Father’s Day invitations, Labor Day invitations, Memorial Day invitations, family gathering invitations, birthday party invitations, and more.